Information makes the web go round, that's for certain. But in order to get more opt-ins and sales, your information needs to stand out…and many times, incorporating printables into your content can do the trick. Customers just LOVE to have something in their hand and if it's something that can help them accomplish their goals, it's all the better. They're tangible. People love to be able to have something in their hand…or like the thought of having them in their hands, even if they download them and never end up printing them. They're action-oriented. If you give out printables like worksheets or planners, they not only give your customer or subscriber information…but they allow them to take action and work toward their goals. They stand out. In a digital world where everyone claims to have the advice to solve a problem with an ebook, report or article, offering printables makes your help stand out. 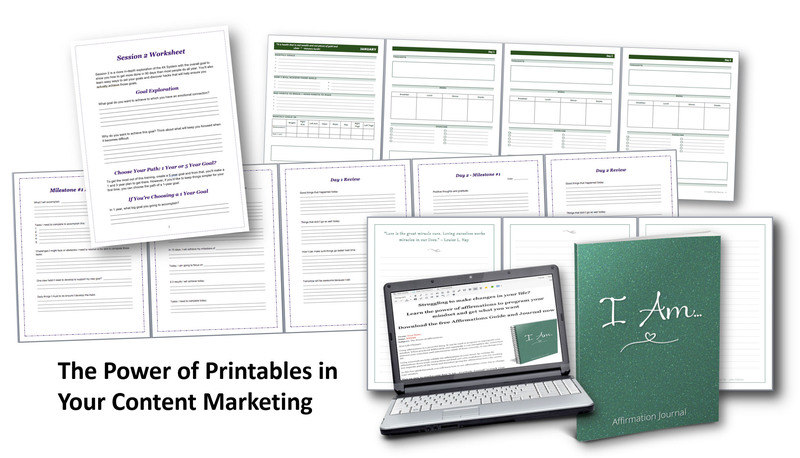 In general, you can't go wrong if you incorporate printable into your content marketing. Here are a few ideas for printables. If you offer a report or ebook…or really any type of content, turn that into a worksheet or a workbook. A worksheet can help your readers work through the information by applying it to their own lives. 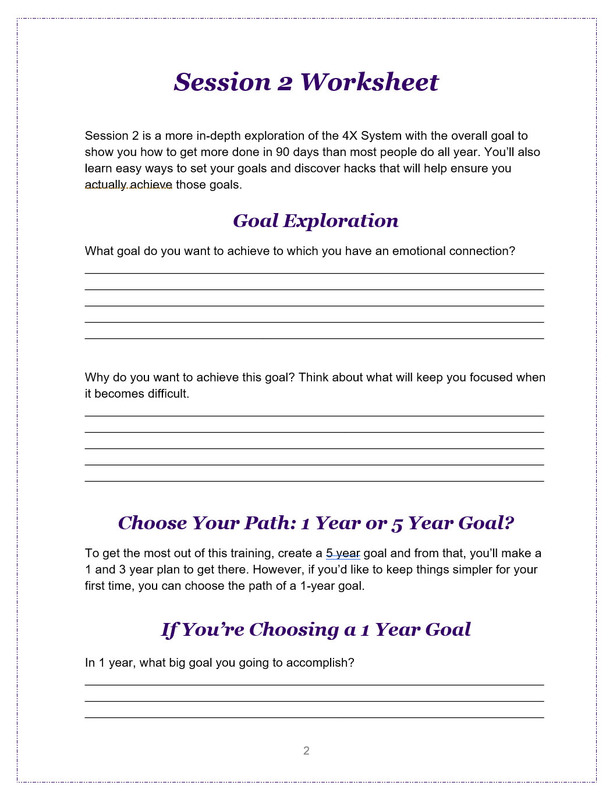 The worksheet helps the student apply what they learned in this session to their own lives, so they can start achieving their own big goals. Whenever you move the student from simply learning to actually DOING, you boost the value of the help you provide them. That means, they're more likely to want to learn from you AND they're more likely to pay more for that learning experience. The above is just a simple worksheet, but you can also create more complex workbooks, with calculations and whatever they need to get organized for solving their problem, reaching their goal, etc. Here's some excerpts from our 4X System Master Workbook that actually does calculations to help students find more time, keep track of their productivity and more. Here's another way to get your readers to take action…by providing them a planner. You can use planners for a variety of purposes. If you teach about gratitude, give them a planner that allows them to focus on gratitude daily. Here's an example from our Planner Mega Pack. It's nothing complicated, but it looks nice and helps your student take action. 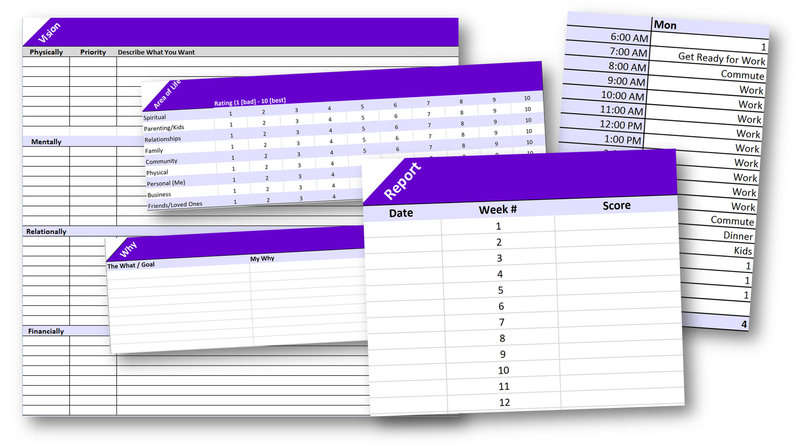 Or if you help your clients lose weight, give them a planner that helps them focus on their health and progress. Here's another example from our Planner Mega Pack. The above one is a bit more complex and involved, but still reasonable simple to put together. Just think about what your student wants to accomplish and how you can deliver it. 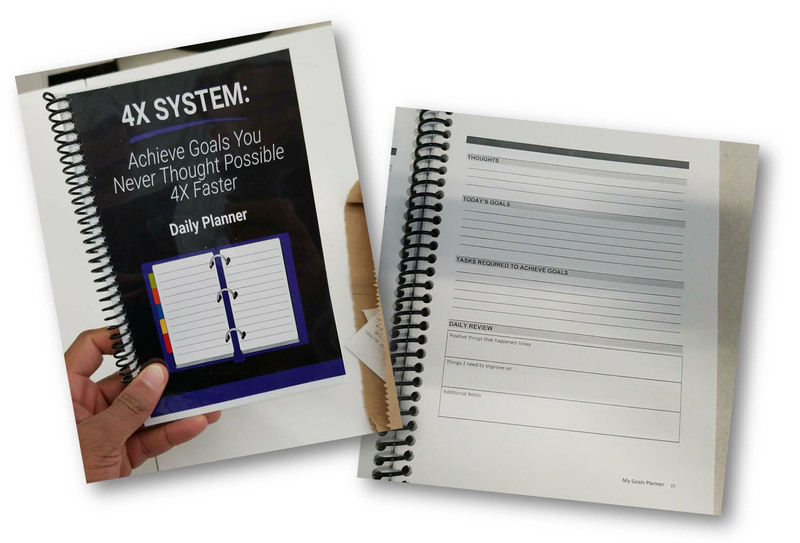 And here's a sample of our 4X System Daily Planner actually printed out and ready for the customer. You can use a service like CreateSpace or Lulu to print on demand. Then you can ship out your real live printables, use them in a classroom environment or whatever you'd like. Similar to a planner, a journal allows your students to chart their progress. And look around any bookstore, they usually have a big section of journals and notebooks because people just love them. Here's an example of a journal from our Journal Mega Pack. This one is a Dreams Journal, but we also have a Gratitude Journal, Goals Journal and an Affirmations Journal. They include an introduction on how to use the journal and then plenty of space for the student to write on the beautifully designed pages that have inspirational quotes sprinkled throughout. Pretty simple, but impactful, hey? When brainstorming your printables, simply think about how your customer could solve their problem or achieve their goals faster. Would a worksheet help? Or could they use a journal or planner to stay on track. Including these items are quite likely to boost your opt-in rate on your opt-in offers and result in more sales of your information-based products, so incorporate them wherever you can.